ARE YOU SUFFERING FROM CYBEROVERLOAD? Do you find yourself getting less done, now that you have constant access to limitless information? When you’re in the middle of a conversation or a meeting, is it difficult for you not to take that cell-phone call or check your Blackberry? When you’re trying to get something done, is it hard for you to stop going on-line to see the latest in what’s happening in the world? Do entertainment and news programs leave you feeling agitated and stressed out rather than informed and entertained? Are you so busy and so attached to technology that you don’t even have time to think? In short, are your communication habits making you feel more connected and in control – or are they controlling YOU and stressing you out? reduce the stress that the digital world contributes to your too-busy lifestyle. 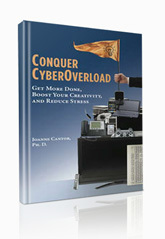 Purchase the Conquer CyberOverload book. $3.99 S&H for any number of books! Or read the book on your electronic device. Conquer CyberOverload is available in electronic form at www.Smashwords.com. Do you have a Sony reader? An iPad or Iphone? Or want to read the book on your smart phone or computer? 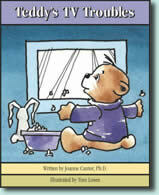 Many versions of the book are now available to be instantly downloaded at www.Smashwords.com. “Conquer Cyber Overload may be the most important book you read this year . . . Conquer Cyber Overload is actually a book for everyone. Bloggers will definitely benefit, as will parents, individuals who work in an office, the list is really endless. It won’t be easy to make these changes, at first, but the end result is definitely worthwhile. Do yourself a favor. Take a break, and read this book. Your life will change because of it. —Seth W. Hall, Vice President, Customer Service, Philadelphia Insurance Companies. University of Wisconsin School of Business. —Julie Fagan, M.D., Clinical Services Chief, University of Wisconsin Hospital and Clinics. $3.00 S&H for any number of books! $3.99* S&H-any number of books! Conquer CyberOverload is available in electronic form at www.Smashwords.com.